Energy Dynamics: Renewable Energy - Capacity vs Capacity Factor: What metrics should we focus on? 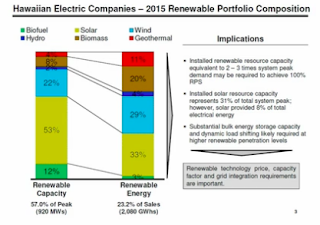 Renewable Energy - Capacity vs Capacity Factor: What metrics should we focus on? While those who chant "100% renewables" or "no-fossil fuel" or "the democratization of electricity" or threaten to go off-grid while extolling the virtues of distributed energy resources to the grid may sound progressive and attractive, how the electric grid functions as a vital public infrastructure to ensure the safe, affordable and reliable delivery of an essential service to all residents and businesses of a community is rarely discussed. While some decry the monopolistic nature of electric utilities, the fact is, no matter what type of ownership model, the operations of an electric utility and the grid are still governed by same physics and economics within the same framework of rules, laws and policy. This is the first of a series of articles of my attempt to take on some basic issues to breakdown the complexity of Hawaii's electric system and the challenge to design and make wise investments to optimize both customer and utility assets to achieve cleaner, safe, reliable and equitable electricity service while keeping the cost of electricity affordable. This is critical not only to bolster our economy but to ensure our quality of life. As we achieve higher renewable penetration levels, the decisions of what kinds of technologies we invest in and who pays will become more contentious if we fail to understand the key technical and economic tradeoffs and just rely on aggressive marketing and political soundbites when making new investments. 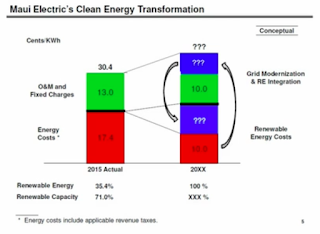 The following presentation, available on video at the link below, by Hawaii Public Utilities Commissioner Michael Champley is a good way to start off this education effort. At the March 2016 Maui Energy Conference, when evaluating Hawaii's renewable energy progress, Hawaii PUC Commissioner Mike Champley posed the important question, "What metric do we look at?" 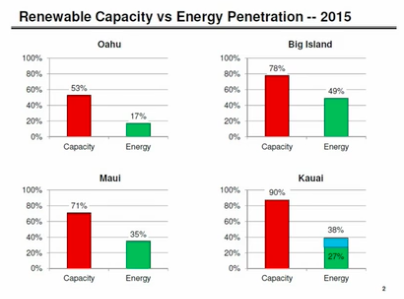 In his presentation, as a panelist on "The Hawaii Renewable Energy Experience - What Can Be Replicated Nationally and Internationally," Commissioner Champley said it was important understand two competing metrics, renewable capacity versus energy penetration, or capacity factor, and walked the audience through each of his slides (some shown here) depicting our renewable progress, current challenges, future challenges and new considerations that come into play regarding key technical and economic tradeoffs. He defined capacity (the red bar) as "the summation of all the renewable energy resources on that island's grid divided by the system peak load regardless of when it occurred, typically for each island in the evening." This is important as the most ubiquitous resource, solar, is not available during the evening system peak. He said fast forward in a year or so and it is likely that the capacity will soon exceed 100% on the islands of Maui and Kauai and Hawaii Island and rhetorically asked, "What are the implications?" He explained, "Once you hit 100% from a capacity perspective the laws of physics take over. You got a real time match of supply and demand and if your capacity is at 100%, any additional capacity beyond that could lead to curtailment or immediate consideration of some kind of storage or load shifting." We already see this happening on many circuits with penetration levels ranging from 100 to 250% of daytime minimum load and with the need to move to the self-supply tariff for new rooftop installations. 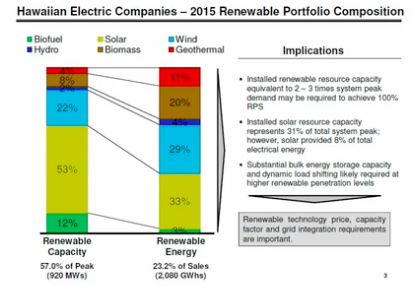 He then walked everyone through the renewable portfolio composition of the Hawaiian Electric Companies, noting that the bars are in descending order of the capacity factor of the resource. For example, although geothermal only accounts for 4% of renewable capacity, it accounts for 11% of renewable energy produced, likewise, solar accounts for 53% of renewable capacity but only accounts for 33% of renewable energy produced, or 8% of total electricity sales. Commissioner Champley stresses that technology (or resource) matters because the more we rely on resources with lower capacity factors, the more installed capacity we are going to need to get to 100% renewable electricity generation. Therefore, how we go beyond the 100% capacity is our next challenge and new considerations will come into play and a diversified resource portfolio is very important strategy, one that should not be overlooked. 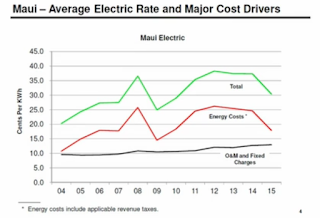 His next slide focused on the two components of Maui's electricity cost, the black line representing operations and maintenance and fixed charges, and the red line energy cost, i.e. fuel and purchased power costs. 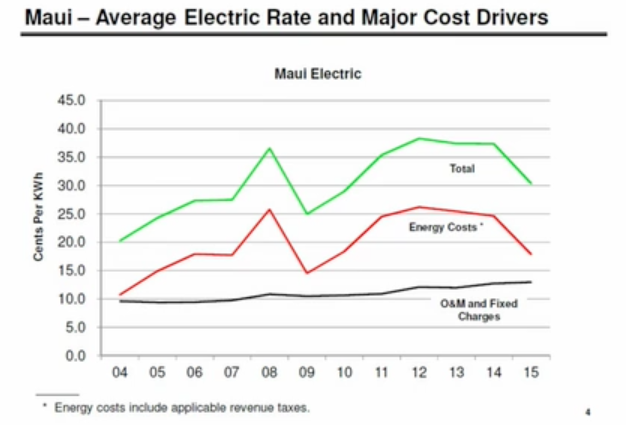 His guess is during the 2012-2014 period, Maui's cost would have been 1-2 cents higher if not for its wind projects. But in 2015, as oil prices dropped, the situation flipped. In his opinion, this isn't a bad situation but delves into the dilemma of how to manage commodity risk and the need to assess the portfolio mix over time, not a snapshot in time. On his last slide, the left bar is a breakdown of Maui's 2015 actual cost, and the right bar is a conceptual of future cost depending on where we choose to make future tradeoffs and investments. For example, if we make further investments in increasing wind and solar capacity, corresponding investments will need to be made in grid modernization, renewable integration and bulk storage. Therefore, will new investments be made in nascent storage technology or pump storage to store and dispatch solar at evening peak? Or will it be made in smaller and flexible fossil generators with the ability to ramp up and down with the variability of wind and solar during the day and be available to address system peak? Which solution will be less risky? Or do we do both? What solution can we afford and have the greatest system and customer benefits? Can we move forward with a no-regret solution/strategy? The logical, economic solutions are there, but it will take the goring of some sacred cows to lay a solid foundation and cost-effective strategy to get to 100%.